Roll rice into a sheet of nori seaweed and you have sushi. 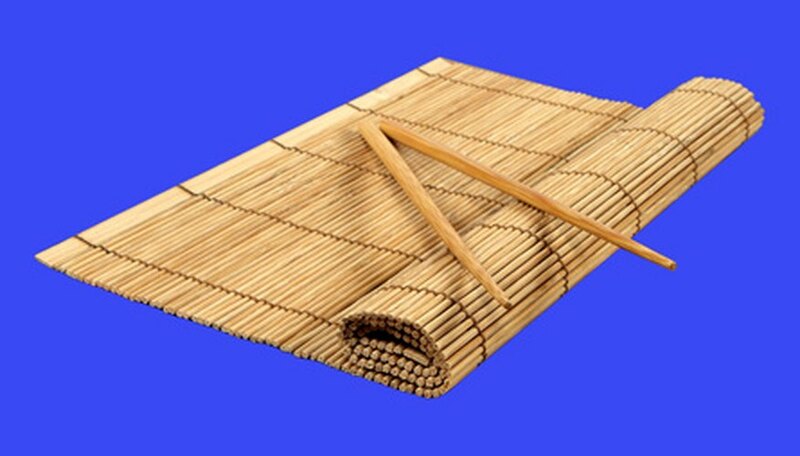 To create the tight roll of the sushi, sushi chefs traditionally use a bamboo mat. The home cook who does not have specialty sushi-making supplies at his or her disposal must find an alternative means of holding the ingredients together to make a sushi roll. A common kitchen towel comes to the rescue in such an instance, and can be used as a stand-in for a traditional bamboo sushi rolling mat. Lay a towel on a working surface and cover it with a sheet of plastic food wrap. Arrange the nori sheets on a baking sheet and warm in a 300 degree oven for 1 to 2 minutes or until pliable. Place the shiny side down of a single nori sheet onto the plastic wrap-covered towel. Spread 3/4 to 1 cup of cooked sushi rice over the nori sheet to cover the entire surface except for a 1- inch edge on two opposite ends of the nori sheet. Place the sushi fillings across the center of the rice parallel to the two edges without rice. Grasp one end of the dishtowel, parallel to one of the ends of the nori with the bare border, and bring the towel over and plastic wrap over the line of filling ingredients in the center of the roll. Tuck the end of the nori under the filling ingredients and roll the rest of the sushi, applying firm and even pressure along the length of the roll. Pull the towel and plastic wrap back as you roll to keep those out of the finished sushi. Stop rolling when the last 1 inch of nori remains. Dab water along the nori strip to moisten and pull it up and over the sushi roll, pressing it in place to make it stick to the rest of the roll and seal the roll. Pull the plastic wrap off of the outside of the roll and use a sharp knife to cut the roll into six to eight pieces, and turn the pieces on their sides for serving.